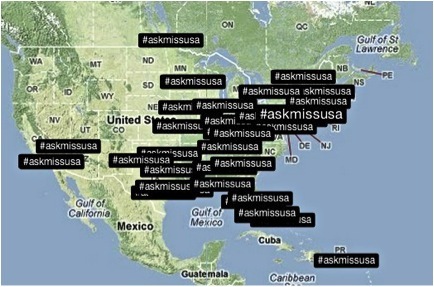 Did Twitter crown Miss USA 2012? Home / Media / Did Twitter crown Miss USA 2012? I just wonder if there will ever be a time with the competition becomes that of an American Idol or The Voice where America chooses who get’s the crown. However, those programs all time Twitter mentions top out around 1.1 million and 4.2 million respectively and with Miss USA mentions only adding up to be 190,000 (34,000 for this year’s ceremony), the Miss USA organization needs to gain a bigger social media presence if they plan on continuing this trend.